IBPS SO Recruitment 2017 – Apply Online for Specialist Officer (SO) Law, IT, Agriculture Field Officer, Marketing Officer Posts: Institute of Banking Personnel Selection (IBPS) has advertised a notification for the recruitment of 1315 posts of Specialist Officer Law, IT, Agriculture Field Officer, Marketing Officer vacancies. Eligible candidates can apply online from 07.11.2017 to 27.11.2017. Other details like age limit, educational qualification, selection process & how to apply for IBPS Jobs are given below. 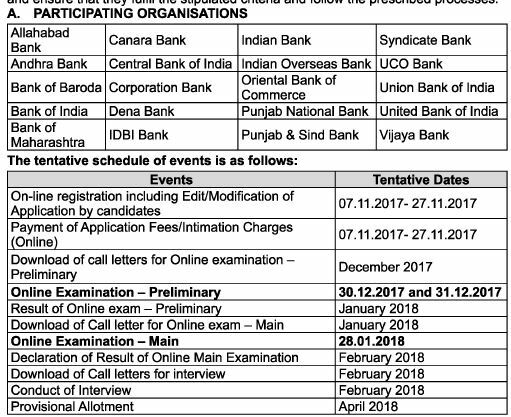 Institute of Banking Personnel Selection Recruitment: 1315 Specialist Officer Law, IT, Agriculture Field Officer, Marketing Officer Posts Download Application at www.ibps.in | IBPS has issued a fresh Notification regarding Specialist Officer Law, IT, Agriculture Field Officer, Marketing Officer Job Openings. Eligible Candidates can Check complete details by Downloading Application Through Official website www.ibps.in | Institute of Banking Personnel Selection Recruitment Selection Process, Syllabus, Age Limit, Eligibility Criteria, Exam Fee, Application Processes, Institute of Banking Personnel Selection Admit Card Date, IBPS Exam Date, Specialist Officer Law, IT, Agriculture Field Officer, Marketing Officer Result Date and Institute of Banking Personnel Selection Last Date Details Given below in this website careers99.com. You are requested to Check before Applying Online. Institute of Banking Personnel Selection has released on its official website www.ibps.in. The Institute of Banking Personnel Selection Recruitment 2017 | Apply Online 1315 Specialist Officer Law, IT, Agriculture Field Officer, Marketing Officer Posts @ www.ibps.in it consists 1315 Specialist Officer Law, IT, Agriculture Field Officer, Marketing Officer posts. All Central Govt Job Aspirants may check this Notification Details in IBPS official Website @ www.ibps.in and careers99.com. Online Registration of Application Form Is Starts From: 07-11-2017. Last Date For Applying Online Is 27-11-2017. Date for Online Examination (Preliminary) : 30-12-2017 & 31-12-2017. Date of Online Examination (Main): 28-01-2018. IBPS Prelims Exam Duration for all the posts is 2 hours. Prelims Exam will be conducted for 125 marks and total 150 questions will be given. IBPS Specialist Officer Law, IT, Agriculture Field Officer, Marketing Officer Recruitment Previous Papers | IBPS Specialist Officer Law, IT, Agriculture Field Officer, Marketing Officer Posts Previous Exam Question Papers are uploaded here for the applicants those who have applied for Institute of Banking Personnel Selection Recruitment 2017. Job seekers who are going to prepare for the IBPS Specialist Officer Law, IT, Agriculture Field Officer, Marketing Officer Exam 2017 can download the IBPS Specialist Officer Law, IT, Agriculture Field Officer, Marketing Officer Syllabus & Exam Pattern in a pdf format for Free of Cost from careers99.com. Institute of Banking Personnel Selection Previous Papers Free Download | IBPS Specialist Officer Law, IT, Agriculture Field Officer, Marketing Officer Exam Previous Papers with Answers are available here in careers99.com to download for free of cost. Here on this website careers99.com, we have provided IBPS Specialist Officer Law, IT, Agriculture Field Officer, Marketing Officer Previous Papers in PDF Format and easy to download. IBPS Specialist Officer Law, IT, Agriculture Field Officer, Marketing Officer Model Papers are available in the PDF format. To get the good score and also beat the competitors score in the written examination these papers will help you to crack the vacancy. careers99.com Team has updated the free download links in the below section of this page. The subject wise previous papers for Specialist Officer Law, IT, Agriculture Field Officer, Marketing Officer exam are available on this page. By practicing the model papers aspirants will be able to get the good score in the written examination.